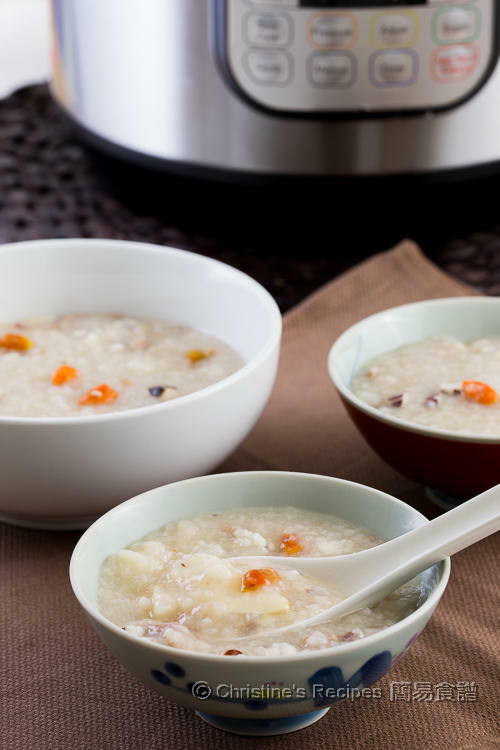 This Chinese yam and pork shin congee can be a light yet nourishing lunch. Goji berries are added to boost eye health. No matter fresh or dried Chinese yam (aka 淮山 or山藥 in Chinese), I like to make congee with it. It’s good for treating poor appetite. 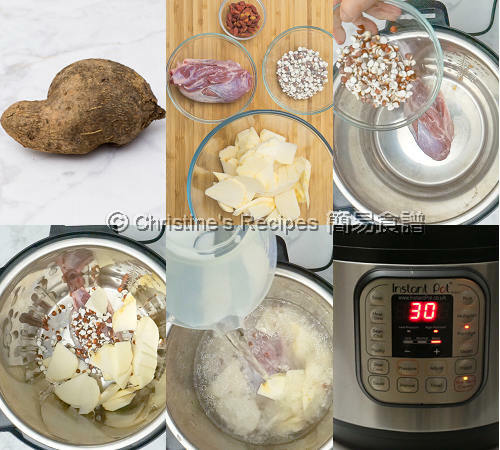 Dried Chinese yam are often already peeled and sliced before dehydrated, very handy to use. Fresh Chinese yam has richer nutrition. You can easily find them in any Asian grocers. Goji berry is another healthy ingredient I used to make this congee. Its reputation of helping to keep eye health is widely spread. I like its orange red colour and sweet taste, enhancing the taste of every dish I made. Whenever I crave for Chinese congee, I turn to my Instant Pot recently. It helps shorten the cooking time a lot. I don’t need to bother if my congee will spill over or sticky to the pot bottom. I also inserted the stove-top instructions for those who don’t have an Instant Pot. Hope you all like this nourishing congee as my family does. Peel the Chinese yam and cut into thick slices if using fresh one. It’s best to wear a pair of gloves when peeling it. Fresh Chinese yam is quite sticky and might make your skin itchy when skin is peeled. Blanch the pork shin in boiling water to remove any impurities. Rinse all other ingredients and drain well. Put all the ingredients, except the goji berries, into Instant Pot. Add water and oil. Cover the lid, turn the steam release handle to the “sealing” position. Select “porridge”, high pressure cooking for 30 minutes. Natural release. Wait until the float valve drops to the down position. Remove the lid. Select “saute” and “medium”. Add goji berries and cook for 5 to 10 minutes, or to your preferable consistency. Season with salt if needed. Serve hot. Put 2½ litres of water and all the ingredients, except goji berries into a large pot. Bring it to boil over high heat. Reduce heat to medium low. Simmer for 2 to 2½ hours. Cook to preferred consistency. Add goji berries and cook for 10 minutes. Season with salt. 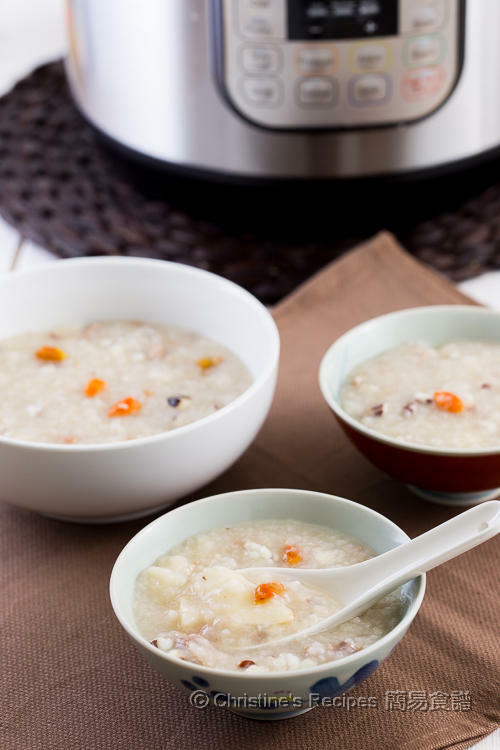 Along the way of cooking, keep an eye on the congee as it’s easily spill over the stove top. Stir occasionally as you don’t want the grains stick to the pot bottom. When cooking with “saute” function on, you need to remove the Instant Pot lid. Or cover with a tempered glass lid. I did it. It is the greatest recipe for this cake so far. Thank you for sharing. Hi Christine, may i know which part of the pork is pork shin? Pork shin is from leg part.